Buenas Dias, UMASH! It was a good several days in Barcelona, Spain, September 4-8 when Bruce Alexander, Jeff Bender, and Amy Liebman presented at the 25th EPICOH Conference – “Occupational Health, Think Globally, Act Locally”. 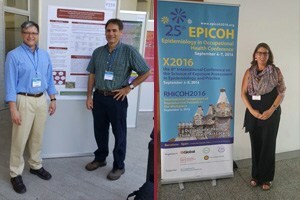 EPICOH is organized by the Epidemiology Committee of ICOH and covers major topics of current epidemiologic research in occupational health. Bruce and Jeff presented a poster on “Adapting the Haddon Matrix to Incorporate One Health for Occupational Health in Animal Agriculture” and Amy presented on our UMASH Seguridad Project results “Health And Safety Intervention For Immigrant Dairy Farm Workers Utilizing Culturally Appropriate Popular Education Approaches”. Bruce also presented other research as well. Gracias a Bruce, Jeff and Amy!